Bubble Jewelry - This is an original sculptural sterling silver statement ring beautifully handcrafted from high polished round silver tubes soldered within a frame. The shank is also created from tubes. Any ring size can be created for you. Availability: One of a Kind Free Shipping. A sterling silver sculptural ring complementing our Bubble Collection. 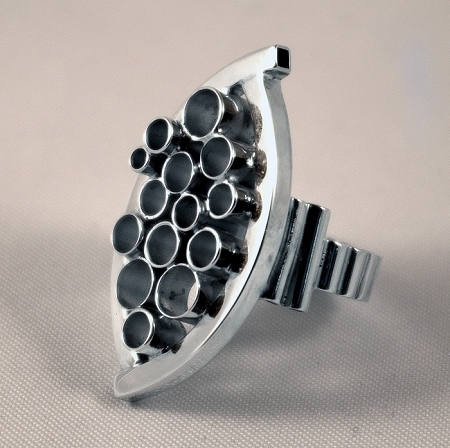 This statement ring has a shank made up of tubes that lay across the finger . The ring can be made in any size and oxidized (blackened) or shiny silver.